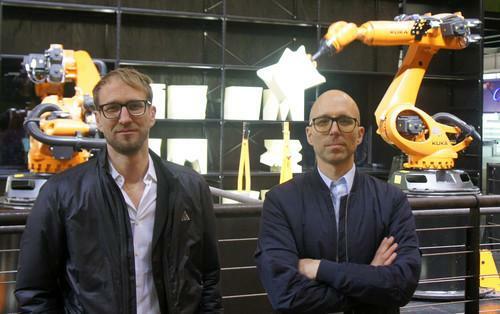 Clemens Weisshaar and Reed Kram designed the Robochop. In a project that brings together 3D modeling, robotics and the Internet, four robots at the Cebit trade show in Hanover will spend much of the next week manufacturing up to 2,000 foam objects designed by Internet users from all over the world. The Robochop installation is part publicity stunt and part showcase for how anyone is able to use heavy industrial manufacturing to design and produce their own things. People from around the world can access the four robots via the Robochop website, where a 3D web app will help them realize their proposed designs. "This is very much about linking digital interfaces and physical objects, and it shows what can be done in a short period of time," said Reed Kram. He created Robochop along with Clemens Weisshaar, who together run the Kram/Weisshaar design studio. Using a hot-wire cutting tool with coaxial cooling, the robots shape high-density foam cubes according to the designers wishes. The coaxial cooling system is triggered by a sensor in the arm of the cutting tool to increase or decrease the amount of cold compressed air blown onto the hot wire. Each cube can be transformed into a stool, small table or something a bit more abstract. The end result will be shipped to the creator, irrespective of where they are in the world. "For us as designers it was also a rare moment to take a step back and trust in the creativity of other people," Kram said. This is the second large scale robotics project Weisshaar and Kram have been commissioned to design. In 2010, eight robotic arms were brought onto Trafalgar Square in London to write messages from the public in light over the square. "The next natural step from that was to create physical objects," Kram said.